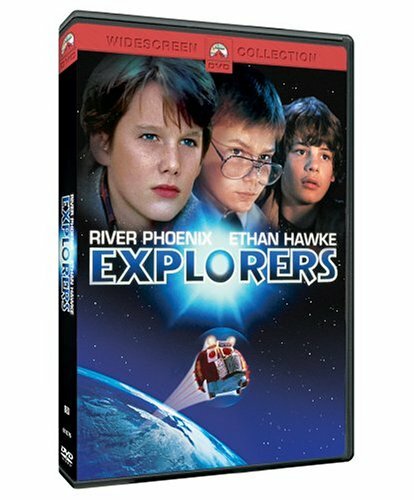 Explorers - BUY THIS DVD! This adventurous space tale stars Ethan Hawke (in his film debut at the age of 14) and young star River Phoenix as misfit best friends whose dreams of space travel become a reality when they create an interplanetary spacecraft in their homemade laboratory. Ben Crandall (Hawke) is a young visionary who dreams of space travel while watching late-night B monster movies, pouring over comic books, and playing Galaga in the confines of his bedroom. But one night he has a vivid dream of flying over a space-like circuit board and shares his visions with his best friend Wolfgang (Phoenix), a young scientific genius who is able to translate his dreams into a complex computer program that actually works. With the help of their new friend (Jason Presson), they create a homemade spacecraft and embark on a secret adventure to another galaxy where they find that things are not always as different as they seem. EXPLORERS features highly imaginative special effects and entertaining space creations from George Lucas' Industrial Light and Magic. HOW TO WIN? SIMPLE. FIRST - Rate and place your comments for 5 movies in our database (Start with "Explorers"). Just scroll down to the bottom of any review, drop a quickie comment and click "Submit Your Comments". THEN SEND IN YOUR NAME AND ADDRESS TO contests@efilmcritic.com. Put "GOD BLESS JOE DANTE!" in the subject line and cross your fingers. There will be 5 lucky winners. We will draw names and one of the DVD sets from Paramount will be yours. Only 1 entry per household.